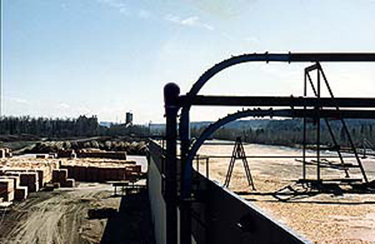 The first Smart Elbow model installed at Northwood in the hog fuel conveying system (above) worked so well that the two sweep elbows also shown above were eventually replaced with two more 12 in. cast iron HammerTek Smart Elbow models. At Northwood Pulp and Timber Ltd. of Prince George, British Columbia, Maintenance Supervisor Mario Rezendes had to deal with a problem common to the pulp and paper industry. Wood particles, in this case hog fuel (bark and sawdust), can become highly abrasive when pneumatically conveyed. At the Northwood facility, wear-back sweep elbows in the 12 in. diameter hog fuel pneumatic conveying line were wearing out every three months and creating repair and clean-up work and expense on a regular basis. Not satisfied with the performance of the hog fuel conveying system, Rezendes tried a new elbow that he had heard about, the Smart Elbow Deflection Elbow by HammerTek, at one location in the three-elbow system. Elbow wear through is a function of conveyed particle impact and friction with sweep elbow walls. The Smart Elbow design changes conveying direction through deflection, not by impact with elbow walls. At system start-up, a loose, slowly rotating ball of conveyed material forms in the vortice vortex chamber at the back of the elbow, cushioning impact and deflecting flow through the elbow. The end result is smoother, more even flow, and the elimination of elbow wear, which is exactly what happened at Northwood. The first Smart Elbow model that Northwood installed lasted four years, as opposed to the several months that wear-back sweeps were lasting. Based on this performance, the other two elbows in the hog fuel conveying system were also changed to Smart Elbow products. Current plans at the Prince George plant call for the installation of three 10 in. diameter Smart Elbow models in the chip handling system. The patented Smart Elbow design does a better job of conveying than sweep elbows. It saves space, cost, and time due to superior design and performance.